The Grade 2, $350,000 Holy Bull Stakes kicks off the 2019 Kentucky Derby trail at Gulfstream Park, where 10 3-year-olds have been entered for the 1 1/16-mile prep led by undefeated Maximus Mischief. Points toward a spot in the Churchill Downs starting gate May 4 will be awarded on a 10-4-2-1 scale, with this race leading into the March 2 Fountain of Youth (G2) and March 30 Florida Derby (G1). 1. Garter and Tie, 6-1 (Brooks ‘N Down – Ralph Nicks/Tyler Gaffalione – 7:2-2-2 – $283,470): This Florida-bred colt has the home track advantage with all seven career starts having been at Gulfstream. He broke his maiden in the seven-furlong Florida Sire Affirmed over Well Defined back in September, then finished a distant second behind Well Defined in the Florida Sire In Reality at 1 1/16 miles. He made his move from mid-pack for both efforts. Then he won impressively against open company in the one-mile Smooth Air Stakes on Dec. 8, running down Souper Jackpot, but could only rally to third behind Mihos in the Jan. 5 Mucho Macho Man, again at a mile. He gets a big class test here. Use underneath. 2. Federal Case, 5-1 (Gemologist – Todd Pletcher/Javier Castellano – 2:2-0-0 – $64,200): Robert and Lawana Low picked this colt up at the Keeneland November Sale for $650,000. Federal Case debuted for WinStar Farm, China Horse Club and SF Racing LLC during Keeneland’s fall meet with trainer Rodolphe Brisset. He took over early traveling seven furlongs and fended off a horse from mid-pack to win. He faced only a field of four in his first start with Pletcher, a one-mile allowance optional claiming race at Gulfstream Park on Dec. 23. Federal Case pressured the pace, and it became a two-horse duel, with Federal Case scoring a neck victory in 1:36.42. Thirteen lengths separated the second and third-place finishers. Board hitter. 3. Epic Dreamer, 10-1 (Orb – Kelly Breen/Irad Ortiz Jr. – 3:1-1-0 – $56,250): The Holy Bull is a chance for Epic Dreamer to rebound from his sixth-place finish as the Remington Springboard Mile favorite. He ran mid-pack throughout and came up empty after traveling four-wide into the stretch, getting bumped late. On Oct. 26, he sparked some Derby dreams while breaking his maiden second out at Belmont Park going 1 1/16 miles. It was an easy front-running victory for him as he cruised home 2 ½ lengths in front, crossing the wire in 1:43.18. First time out in December he was defeated only by Nashua (G3) winner Vekoma and finished ahead of Mihos after sitting off the pace. Epic Dreamer’s last work came Jan. 18 at Palm Meadows, where he went four furlongs in 49.20. Live longshot. 4. Everfast, 25-1 (Take Charge Indy – Dale Romans/Chris Landeros – 6:1-0-1 – $42,685): Everfast won on debut at Ellis Park but has only hit the board once since. He ran in both Churchill Downs’ Iroquois (G3) and Keeneland’s Breeders’ Futurity (G1), making mild rallies. 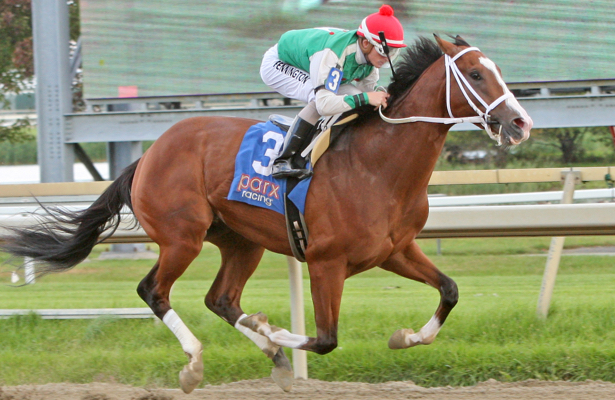 The colt showed improvement in an October allowance optional claiming race at Churchill Downs. After dueling for the lead going 1 1/16 miles, he finished third. Everfast raced at the rear throughout the Kentucky Jockey Club (G2) and finished last, but the track was sloppy that day. He slightly improved to fourth after racing off the pace in a Gulfstream allowance optional claiming race Jan. 18. Everfast doesn’t appear to have a true comfortable running style yet, and he hasn’t found success at this level. Toss. 5. Harvey Wallbanger, 8-1 (Congrats – Kenny McPeek/Brian Hernandez Jr. – 4:1-3-0 – $91,200): Harvey Wallbanger finished second in his first three races, but was up against tough competition. He finished behind Champagne (G1) winner Complexity at Saratoga, then missed Plus Que Parfait, the Kentucky Jockey Club (G2) runner-up, by a nose at Keeneland. He was second to stablemate King Ford at Churchill Downs before breaking his maiden there on Nov. 17. He rallied from far back to complete 1 1/16 miles in 1:46.71. The colt put in a bullet breeze two works back at Gulfstream Park, getting a half-mile in 47.60 on Jan. 17. The distance seems up to his liking and recent form shows him as a closer. Use underneath. 6. Mihos, 7-2 (Cairo Prince – Jimmy Jerkens/John Velazquez – 3:2-0-1 – $108,880): Mihos could represent the biggest challenge for Maximus Mischief. First time out at Belmont he finished third behind Vekoma and Epic Dreamer. He won second asking when sprinting six furlongs at Aqueduct Nov. 24. His Mucho Macho Man victory was impressive in the fact he brushed with another horse and rallied to a neck victory after turning five wide. He’s one to sit mid-pack or further back, but will need a stronger finish if Maximus Mischief is able to sit comfortable up front. Win contender. 7. Come On Gerry, 10-1 (Elusive Quality – Dale Romans/Robby Albarado – 2:1-0-0 – $24,325): Albaugh Family Stables is back on the Kentucky Derby trail. Come On Gerry is one of their hopefuls this year, and the Holy Bull marks his stakes debut. The Ontario-bred colt stretched out to 1 1/16 miles on Dec. 28 at Gulfstream Park and led every step. The time was 1:44.12, and he finished 2 ¼ lengths clear of the favorite to earn a try at this race.. Live longshot. 8. Maximus Mischief, 5-2 (Into Mischief – Butch Reid/Jose Ortiz – 3:3-0-0 – $192,100): Maximus Mischief took a major step up when he came out of two easy Parx victories to win the Remsen (G3) at Aqueduct. There, he stretched out to 1 1/8 miles and bested favored Network Effect by 2 ¼ lengths. He also sped the fractions up to 23.93 and 23.88 when gaining the lead after a slow opening quarter mile in 25.12. The Remsen gave him stakes experience around two turns, and it validated his runaway Parx victories. While his final tune-up was an easy half-mile in 50.06, he drilled a bullet five furlongs in 58.02 for his penultimate work. The top choice. 9. Gladiator King, 25-1 (Curlin – Jaime Mejia/Carlos Montalvo – 8:3-1-0 – $93,800): His last-place performance in Tampa’s Pasco Stakes on Jan. 19 can be excused, given he broke through the gate, ran about a quarter of a mile before caught by an outrider and didn’t scratch. But in the Mucho Macho Man and the Remsen, he faded from the lead to the back of the field. Less of an excuse there. Gladiator King ran better in the Dec. 15 Inaugural Stakes at Tampa, taking over early and winning at six furlongs. He’s been running well with a compact schedule but doesn’t appear classy enough here. Toss. 10. Going for Gold, 30-1 (Atreides – Bob Hess Jr./Albin Jimenez – 2:0-2-0 – $16,800): The Holy Bull will mark Going for Gold’s first attempt past six furlongs. In two maiden special weight sprints at Laurel Park, the gelding missed by a neck Dec. 9 and then by a nose 20 days later. Both runs came on the lead, and he’ll have a longer distance to hold on in the Holy Bull with stakes winners behind him. He’ll also have to use speed early if he wants the lead from post No. 10. Toss. Summary: Maximus Mischief and Mihos bring in the strongest credentials, with the former looming large as an undefeated prep winner. Todd Pletcher has always had success on the Derby trail at Gulfstream, and Federal Case appears to be going in the right direction so far. The other maiden winners get their chance to break through, and if you think Epic Dreamer is better than his Springboard Mile performance, you’ll get him for a nice price here. Garter and Tie still has to prove he wants two turns, but he’s consistently hit the board at this track.